The host school greeted the delegates with warm welcome as soon they entered the school campus which flattered their arrival. The registration of the participants then followed. Picture-taking and light conversations took place as some of the delegates got the chance to meet new faces. 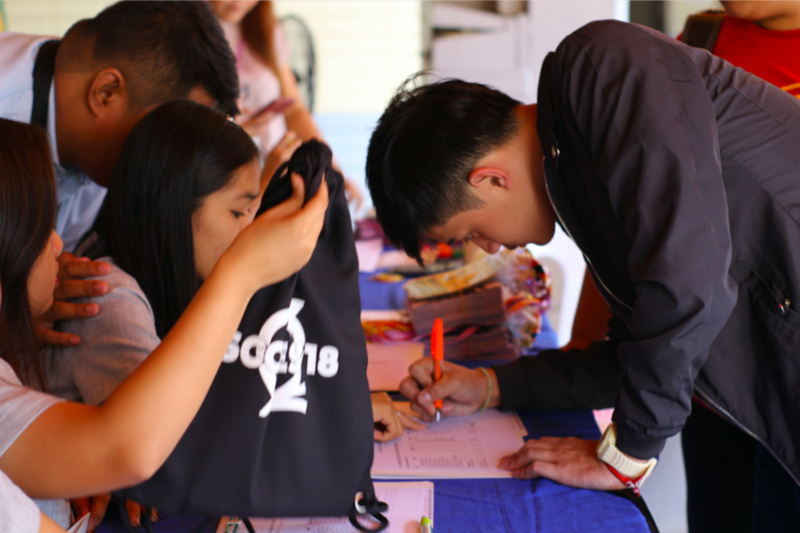 Delegates register at the beginning of SCORES 2018. 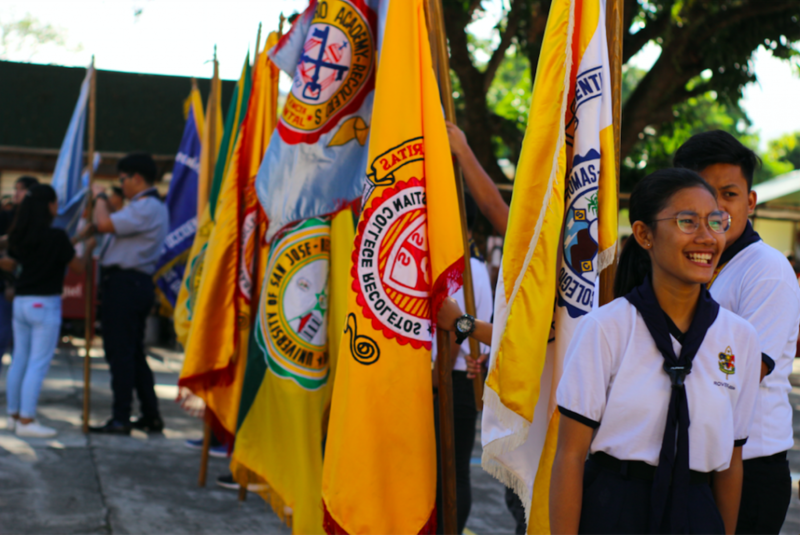 Moreover, the delegates also got the opportunity to roam around the campus to familiarize themselves with the facilities and installations inside the school. As they continue touring around and acquainting with some strange faces, an ambush interview to some of them took place regarding their impression and insights about the hosting of CST-R in this year’s SCORES. “I felt nervous since it’s too far away from my home, but excited of meeting new friends. In the afternoon, a Holy Eucharist was celebrated with its main celebrant, Rev. Fr. Dionisio Q. Selma, OAR together with the Recollect priests and family. Fr. Selma emphasized the Year of Clergy and the Youth. He accentuated the love of God and preached the oneness and similar spirituality of the OAR schools in the Philippines. He reminded everyone that God loves us despite of who we are and how sinful we are. He will be with us until the end, for he never changes. He sends His people to lead us closer to Him and these people are our family, teachers, and companions. Moreover, Fr. Selma let out a chiasmus: The gift represents the person, the person represents the gift. If one would give, it must come from the heart. If not, it has no value, because there’s no sincerity. Also, he added: “Loving God means loving our neighbor as well as catechizing and caring the youth.” He reminded that everyone must have Christ in their lives and they must get up and do good. Through this homily, everyone clearly deciphered the love of God. “It is possible to give without love, and it is impossible to love without giving. Love means sharing what you have. Love isn’t love, unless it is shared,” said Fr. Selma. Fray Dionisio Selma, OAR, Prior Provincial, presided the opening Mass of SCORES 2018. Together with him in the altar were Fray Joel Alve, OAR (left), Director of CST-R, and Fray Vicente Ramon, Jr., OAR, (right) Prior of Recoletos de San Carlos. After an hour of heartfelt celebration of the Holy Mass, the opening program then followed wherein Rev. Fr. Joel A. Alve, OAR, the school director and principal, delivered his welcome remarks. A formal ceremony was then initiated to hand the delegates to their respective foster family. The day ended with endless laughter and fun as the Recollect community starts to build a stronger foundation of camaraderie. On a more positive note, the delegates finally got the time to spend their remaining days with their foster family. Some of them were expecting to venture a whole, new experience in CST-R and to propagate unity among Recollect schools through SCORES. Long Live the SCORES!